The final emotions will be elation or regret. 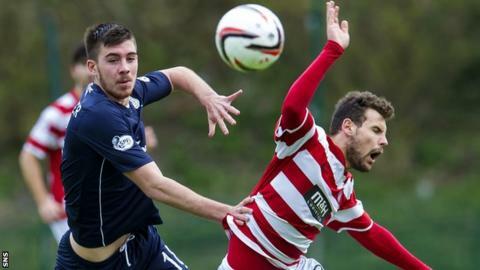 By the end of the Scottish Championship season, either Dundee, Hamilton Accies or Falkirk will be celebrating promotion while the other two sides must regroup and hope that their nerve will survive being stripped bare again in the play-offs. By now, psychology is all that the respective managers have left. Paul Hartley has kept his Dundee players out of sight this week, as if a forced sense of normality will usher all of the tension out of their minds. The dynamic, with Dundee leading Hamilton by two points and Falkirk by three, means that the control belongs to Hartley's side. The title has been within their reach for the entire season. That brings its own pressure, since the cost of missing out will be a heavy and draining sense of failure. There would be financial implications, too, since the club has budgeted for promotion and there is thought to only be a fragile alliance in the boardroom between the American investors who bought a controlling stake and the local businessmen and fans who make up the rest of the directors. There would be devastation, in mood at least, if Dundee fell at the final hurdle. Tim Keyes, the Texan who is chief executive of Keyes Capital and who invested in the club along with John Nelms, the Dundee director, insisted that budgets will be stable in the event of promotion or relegation. The notion remains, though, of a club that needs to gain promotion not only out of a sense of ambition. Hartley was tasked with completing the job, having replaced John Brown in February with 14 games remaining and Dundee joint top of the table with Hamilton. It has been that way all season, with the two sides swapping the lead for all but the opening weekend, and once when Falkirk moved to the top for one week. The new manager has lost three and drawn three of his 13 games in charge, but mostly he has brought a renewed vigour and intensity to the team. Hartley built something lasting at his previous club, Alloa Athletic, winning back-to-back promotions, but has been limited at Dens Park by working with a squad that was assembled before he arrived. No Championship team will have spent more on their budget this season than Dundee, but then no club would attract a crowd of more than 10,000, as Dundee will at home to Dumbarton. Their opponents are capable of overturning any side in the Championship, as Hamilton found to their cost in a 4-1 defeat last weekend. Dumbarton are the top scorers in the division and will feed off any nerves or inhibition in their opponents. It is that potential ruthlessness, of a team playing with freedom and certainty, that forms the basis of the hope that Hamilton and Falkirk still hold. In a way, their ambitions are not wholly at stake, since they are both guaranteed to finish in the play-off positions, along with Queen of the South, and so would have one more opportunity to climb up to the top-flight. Even so, Hamilton appeared to have grasped the initiative when Dundee lost to Morton two weeks ago, only to then surrender it last weekend. They now have to rely on Dundee dropping points but also on their own ability to see the job through. The manager, Alex Neil, is adamant that he won't monitor the score at Dens Park while his side faces Morton at home, but then all of his team's supporters will be, so there will be no way to ignore the circumstances as they unfold. A manager might be able to organise and motivate his players, but there is little control that can be applied to temperament and composure in such an unpredictable occasion. It is in these fraught moments that boldness can be rewarded. Falkirk are, in one respect at least, liberated by the fact that they have nothing to lose. They are the outsiders of the trio - as the manager, Gary Holt, has insisted all week - and their overriding aim is to win their game at home against Alloa, because then they will have done all that they can to affect proceedings. That in itself clears the clutter from the players' minds. All three clubs can take comfort from having created a mood of optimism. There might be a financial imperative to Dundee gaining promotion - even though next season's Championship will involve Rangers and Hearts, and perhaps one other side coming down from the top-flight - but there is something to build on at Dens Park. Hamilton and Falkirk, in their reliance on youth development and building strong, stable and lasting links with their local communities, have become model clubs. Beyond an unlikely injection of capital, there is no means for them to overtake rivals other than by good husbandry, of setting standards of excellence in their academies and their boardrooms. Both teams have secured their young talent for future seasons and will continue to follow their current strategies even if they gain promotion, rather than bringing in a squad of experienced, ageing professionals and pushing the youth players to the periphery. There is much at stake for the immediate future but also recognition that applying the right model and standards can be rewarded. Dundee, by virtue of their budget and their slender lead, have it all to lose. That alone can constrain players - who become bound by their fear of failure - but in Hartley they have a progressive, clever and resourceful manager. It lies in Dundee's favour and all that Hamilton and Falkirk can do is rise to their own individual challenges and hope that fate aligns with them, too.